George Harrison and Michael Jackson in a recently rediscovered radio chat. 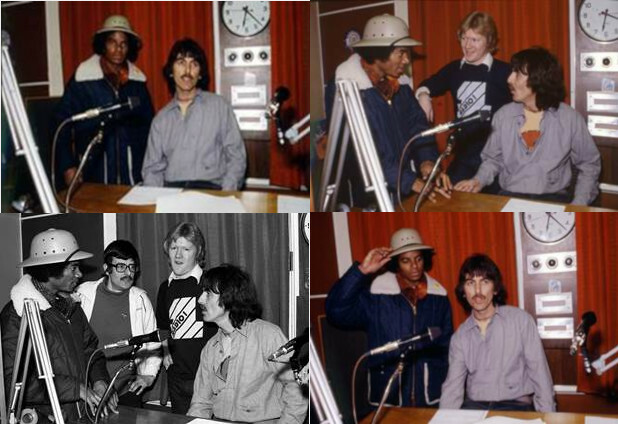 Thanks to one of our readers, Richard M White, a BBC radio 1 radio programme with George Harrison and Michael Jackson as guests in the studio is to be aired anew. Wiped by the radio station, a home recording supplied by our reader is the centre of a new presentation, to air this Saturday. The occasion is 40 years since the programme was first aired, February 9, 1979. The programme in question was an edition of BBC Radio 1’s Roundtable, hosted by David ‘Kid’ Jensen where the famous guests reviewed the latest releases of the week and chatted in a very rare informal style about life and their experiences in the music industry. The recording has been remastered for this one hour presentation, which also will include new interviews with Kid Jensen and others who were present that day. The aptly titled "When George met Michael" is presented by Paul Gambaccini and can be heard on BBC Radio Solent on Saturday 9th February at 11am. The programme will also be available on the BBC Sounds website for 30 days afterwards. And speaking of BBC Radio, you can still listen to their half hour version of a programme about the Beatles' rooftop concert broadcast for the 50th anniversary on BBC World Service. This is similar but shorter than their 40th anniversary broadcast, and possibly also of their 30th anniversary broadcast of same. You can listen to the programme here. Why is Michael wearing a pith helmet? Wait...never mind, I don't really want to know. Clearer but glitchy at start, improves as it progresses. Very annoying that commentary put over the new records they were listening to and commenting on. The listener cant judge what they were judging. Turns out I was right, the helmet was purchased that day, but army surplus, not charity shop. Much respect to Kid Jesnsen for not asking the re-union question. I hope someone is able to download this and keep it for posterity. The fidelity is much better then the Youtube version and it's a fun interview and the new bits contextualizing it are nice also.